Welcome to my website. This is not a professional or business website. This website is for family photos, and for information and links to my hobbies and interests, including music, astronomy and animals. 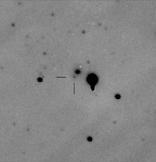 The Puckett Observatory Supernova Search discovered the first supernova of 2012 and 2013. A beautiful image of 2012A appears as an Astronomy Picture of the Day. For a complete list of discoveries, visit the POSS Discovery page. The POSS team has over 270 discoveries. Type Iax Supernovae: A New Class of Stellar Explosion: This new class currently has 25 members, and the Puckett Observatory Supernova Search has discovered 7 of them: 2008ha, 2008ae, 2007J, 2006hn, 2005cc, 2003gq, 2002bp. Visit the Discovery page for more information. 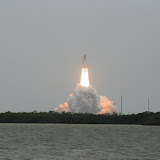 Tim and I went to Cape Canaveral to see the final launch of the Space Shuttle on July 7, 2011. You can click on the thumbnail to see photos from the launch of Atlantis. Our dog Pepper passed the Canine Good Citizen test in 2011. Pepper and I visit nursing homes as part of St. Martin-the-Fields Episcopal Church's Pet Therapy program. CBS Channel 46 featured Pepper in a recent edition of "Positively Atlanta." For more information on St. Martin's Pet Therapy program, visit their Pet Ministry website. The Canine Good Citizen program is sponsored by the American Kennel Club. Please spay and neuter your pet. If you live in the state of Georgia, visit SpayGeorgia for lowcost spay/neutering services. For some interesting links to various websites, visit my Links Page.